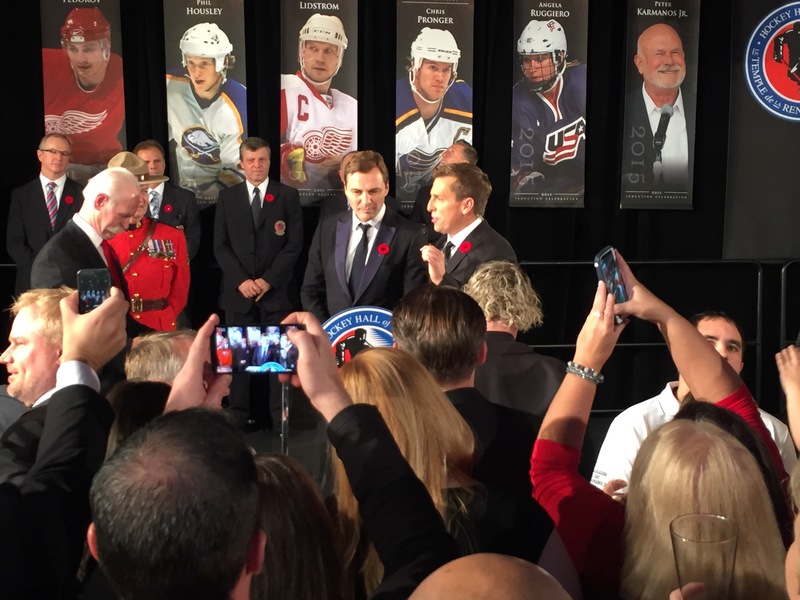 I’ve posted about the calligraphy I do for the Hockey Hall of Fame in Toronto. 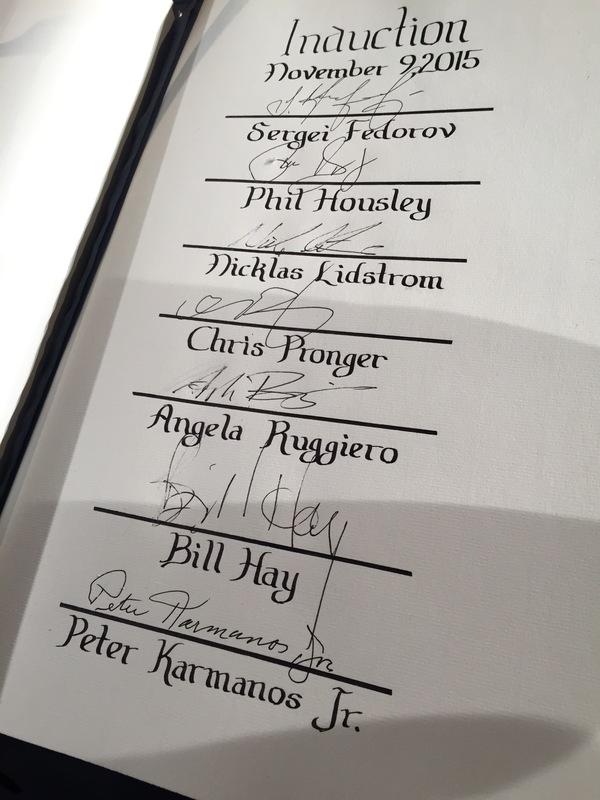 Well, last night the inductees signed it. 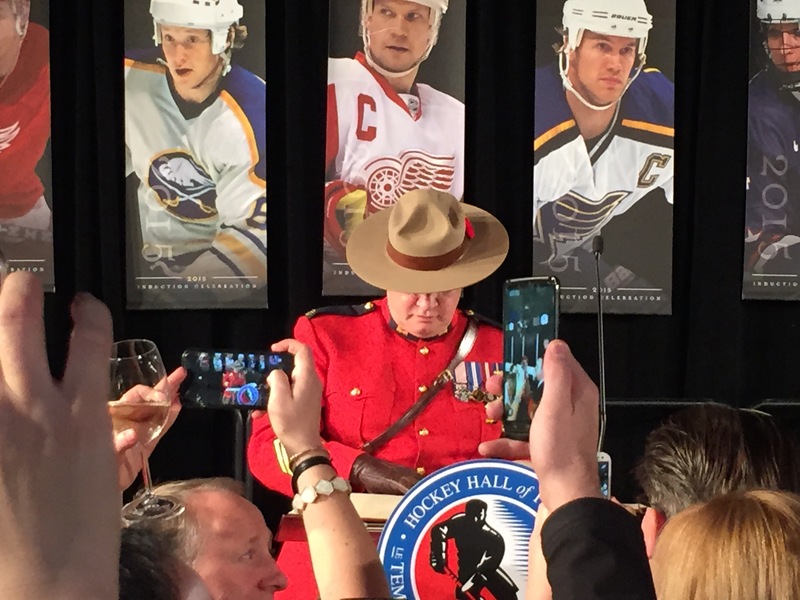 It’s fun to catch up with people you see once every year, but for me, the best is still witnessing the inductees signing “my autograph book”, which by the way is carried in to the room by an RCMP officer. How cool is that? I couldn’t get any closer, and there was a disturbing sea of cell phones in my way! First up, Sergei Fedorov. He won the Stanley Cup three times with the Detroit Red Wings, and was the first European-trained player to win the Hart Trophy. Angela Ruggiero played for the USA Women’s team. With this four time Olympian (medals each time) and four time World Cup gold medalist, the boys are in good company this year. I’ve actually met Bill Hay a few times and still managed to learn some things. He was inducted in the builder category, but he also played for the Chicago Blackhawks from 1960-1967. 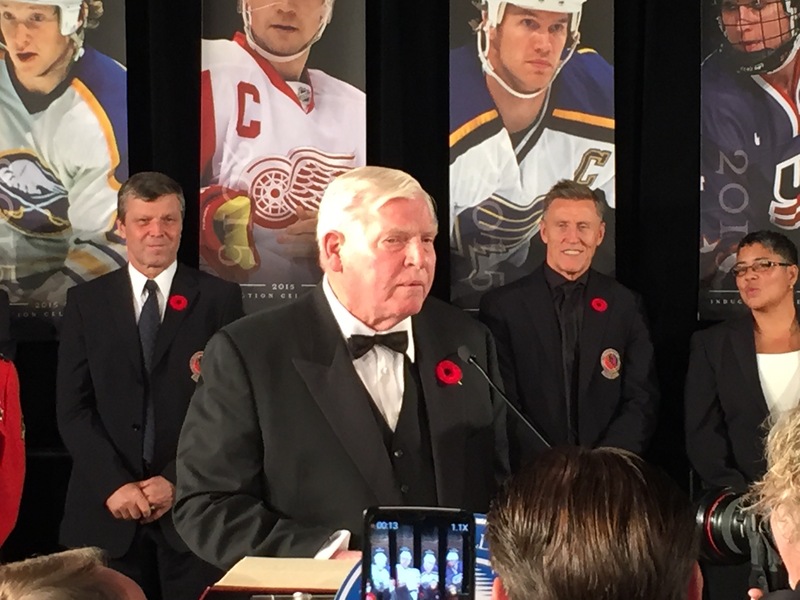 He played centre to Bobby Hull and Stan Mikita in 1961, bringing home the Stanley Cup (the first Cup Chicago had won since 1938). 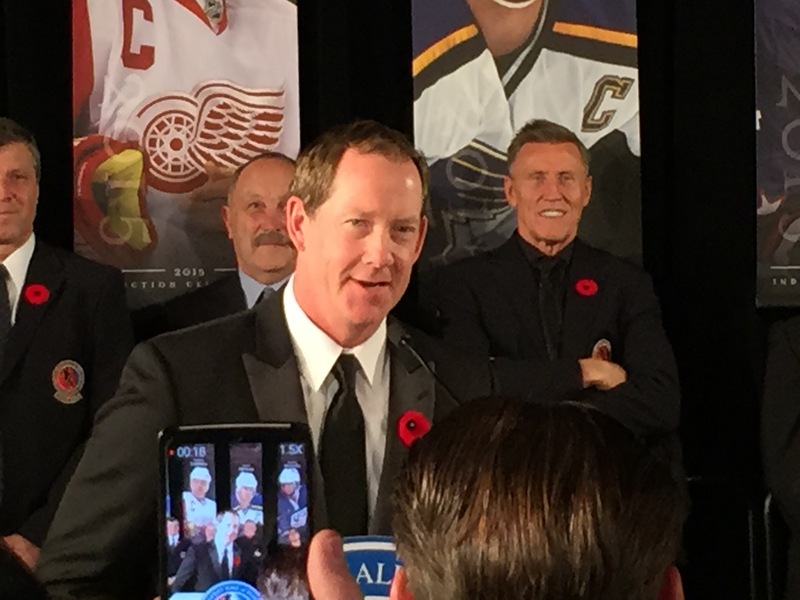 Phil Housley played for Buffalo, among others. Part of the NHL Rookie Team in 1983 he also went on to play in the All-Star Games in 1984, 1989, 1990, 1991, 1992, 1993 and 2000. The next two guys are REALLY well known. 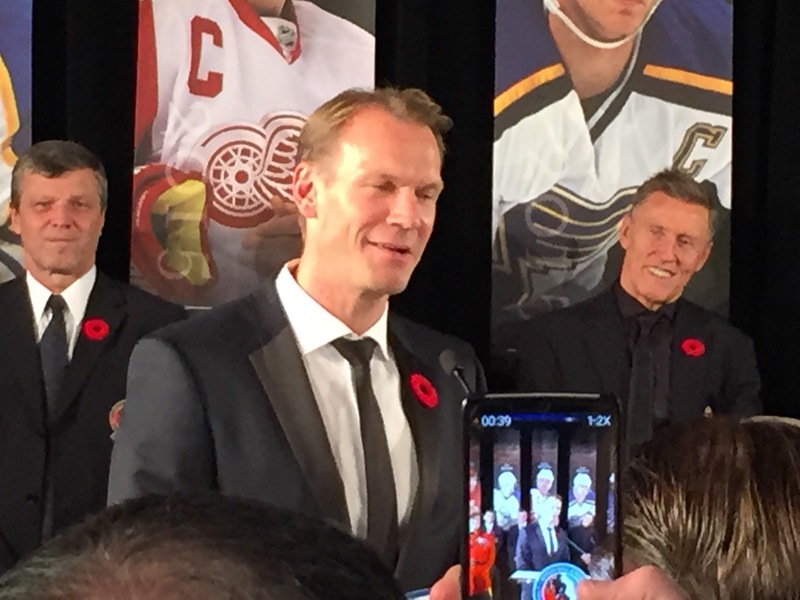 Niklas Lidstrom was captain of the Detroit Red Wings at the end of his 20-year hockey career. Thank you Wikipedia for the stats. Four Stanley Cups, seven James Norris Trophies, one Conn Smythe Trophy, and voted into twelve All-Star games. 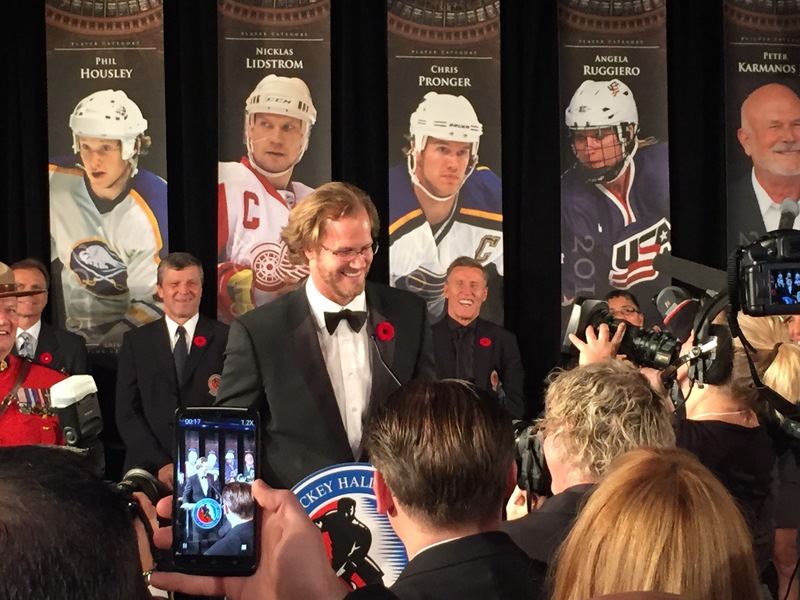 Last, but not least, Chris Pronger. Bless him, he was suspended eight times. He must have been doing something right though, because he won the Stanley Cup with Anaheim in 2007, and the Hart Trophy in 2000. He was the first defenseman to do that, since Bobby Orr (you may have heard of him) won it in 1972. Once the autographs are collected, I have to be very sneaky. I pass my phone off to someone on stage to take my “after” picture. I have a growing collection. Feels pretty awesome! …and it may just be me, but I think Borje Salming is just wonderful smiling in the background of all the pictures! This is one of those weird things I do. Okay, not weird. I think it’s cool, and kinda fun. I guess it still surprises me how many people don’t know I do this. It started 11 years ago. 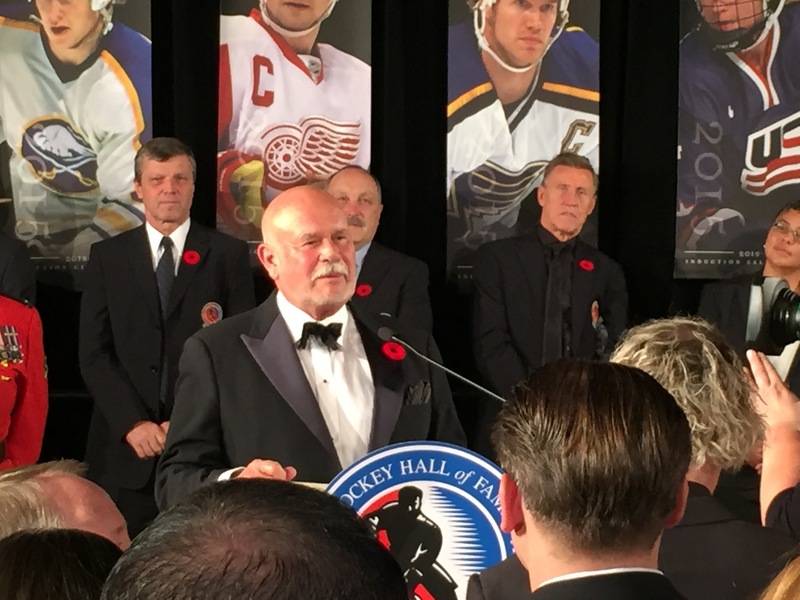 The Hockey Hall of Fame was looking for someone to do calligraphy of the inductee names. The lady they asked first basically chickened out. Really it’s kind of a fluke they even asked me. The guy I was dating worked there, and asked me if it was something I knew how to do. Oddly, yes. I sent a draft to show them some options. The rest, as they say, is history. I can still remember one of the guys who worked there saying, “Don’t f*ck it up.” He swears he didn’t use those exact words, but that’s what stuck in my head. It’s a heck of a thing to have going through your head when you put ink down on really thick, textured paper, that isn’t perforated and can’t be torn out. The book is huge. It’s hard leatherbound, 18″ x 13″. “Don’t f*ck it up.” Pfft. So what do I do the second year? I manage to screw up the spacing between the second and third names. Come on! I had one job, right? It’s been years now, so I think it’s safe to let the HHOF know. That thing they liked? Yeah, it was a mistake. They happened to like it, because the “Builder” category was spaced a little further away from the players. It works. I’ve had the profound pleasure of putting in some huge names in hockey. No, not Gretzky, that was before my time. 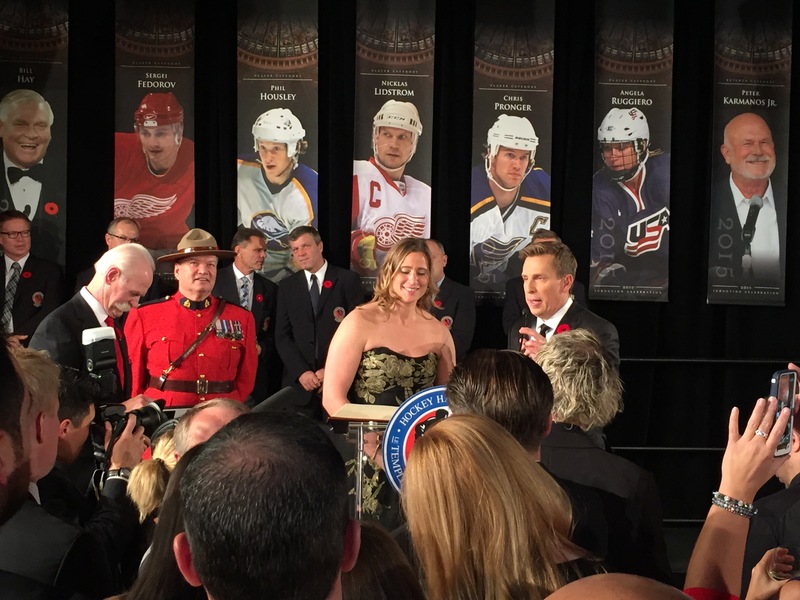 But Mark Messier, Doug Gilmour, Glenn Anderson, Pat Burns, Brett Hull, Chris Chelios, Scott Niedermeyer and the women Angela James, Cammi Granato, and Geraldine Heaney. I inked Joe Nieuwendyk’s name in 2011, but refuse to show you how badly I botched that one. “Don’t f*ck it up”. I didn’t notice, Joe didn’t notice, the people visiting the HHOF and seeing the book in its glass case didn’t notice, the staff didn’t notice…until two weeks later I was called in to “fix” it. I’ll never forget how to spell … N i e u w e n d y k …now. 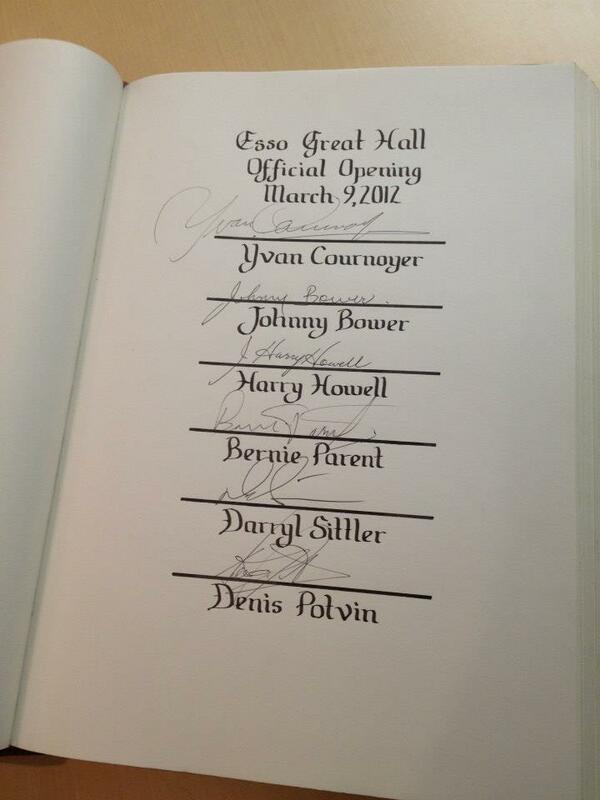 Then I was asked to do the page for the Grand Opening of the Great Hall just a few months after. I’ve never been happier to turn a page in my entire life! There’s something about being the person to write Johnny Bower’s name in a book and knowing he’s going to sign right there, still gives me goosebumps. 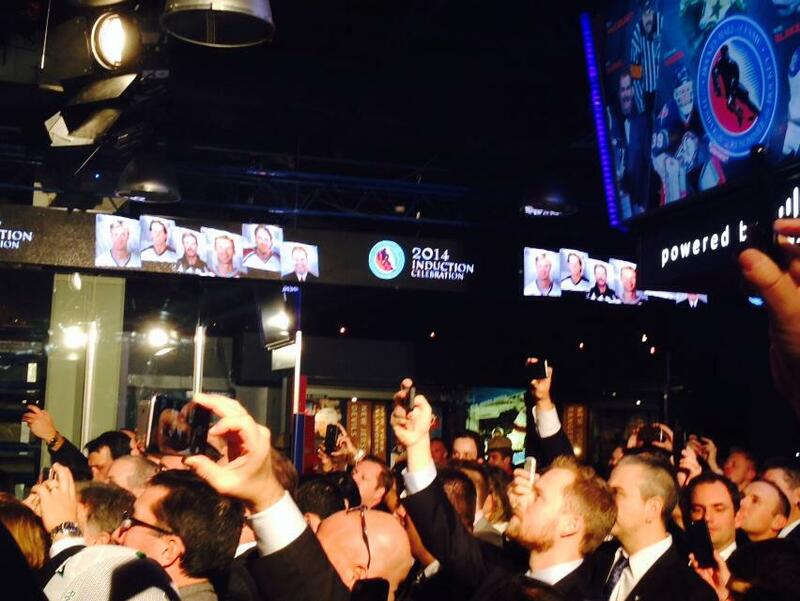 Every year people gather, nay cram themselves, into the game area downstairs at the Hall to watch people sign. It’s a lot of attention for my little autograph book. “Don’t f*ck it up” was going through my head again today. 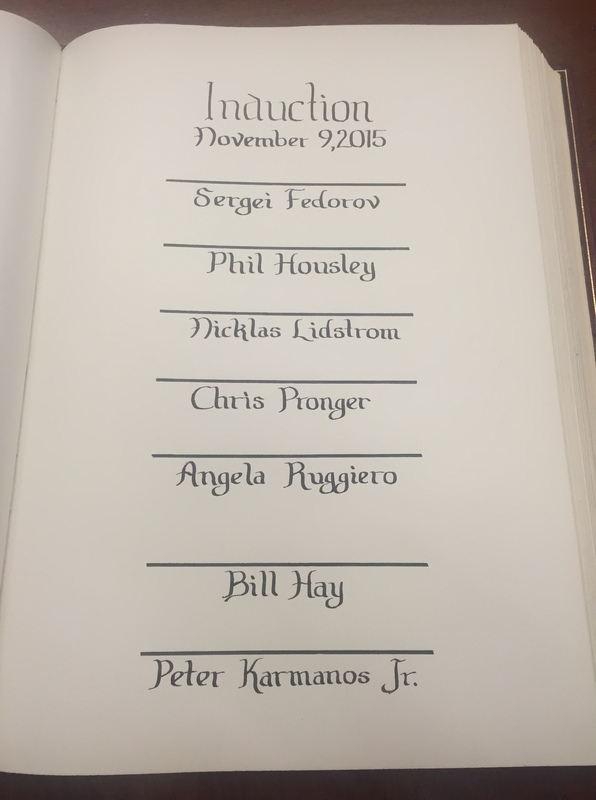 After much cursing, calling for help and a knife, this year’s page is ready for the inductees’ signatures. Whew!